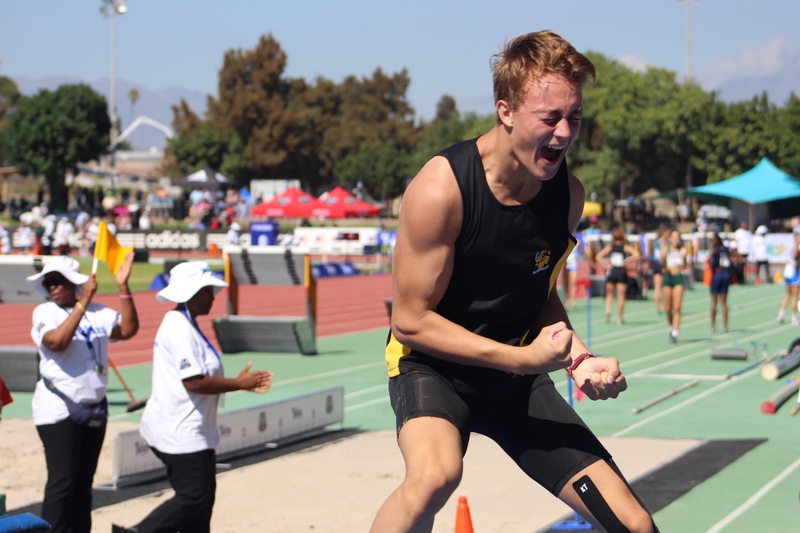 Boland’s Kyle Rademeyer and Central Gauteng Athletics (CGA) Dane Roets shined at the Twizza Athletics South Africa U18 & U20 Championships in Paarl. The duo broke the SA records in their respective events. Rademeyer was on top of his game after scrapping his provincial teammate Valco van Wyk pole vault record of 5.22m in 2017. Rademeyer mastered 5.30m and could have not asked for a better day at the office. While Roets was in a class of her own after she won the discus event with a distance of 17.69m to break Lezaan Jordan’s SA record of 17.52m. On the first day of competition the bronze medalist at the Youth Olympics took the gold medal in the girls U18 shot put event. However, Athletics Gauteng North still dominated the competition. They ended off the competition with 30 gold, 31 silver and 16 bronze medals. They were followed by neighbours CGA and hosts Boland. Among AGN’s stars was Antoinette van der Merwe. The young speedster was in a class of her own in the girls U20 100m hurdles and 200m sprints. Van der Merwe took the girls U20 100m hurdles title in a time of 13.91 seconds. She was followed by former champion Rogail Joseph from Western Province Athletics and her provincial teammate Elitha Sylvester. Antoinette then showed her dominance in the Girls U20 200m sprints clocking 24.39 seconds to grab the gold medal. Her provincial teammate Michael Schoeman was in fine form to claim the gold medal clocking 13.54 seconds, missing the Mpho Tladi’s national record by 0.05 set in 2016. Schoeman was the favourite coming into the final after clocking 13.79 seconds in his heat. AGN did not only take the boys and girls U20 short hurdles titles but they took the boys U18 100m hurdles title through Reynardt Strauss who clocked 13.58 seconds. They went on to win the tremble as Dylan Coetzee and Jorim Bangue finished in second and third place respectively. The trio dipped under 14 seconds in the boys U18 100m hurdles final. Their provincial teammate Sinesipho Dambile stormed his way to a comfortable victory in the boys U18 200m sprints clocking 20.68 seconds. The lanky athlete dominated the field and could not have asked for a better outing. The IAAF World U18 and U20 400m hurdles Champion Zeney van der Walt powered her way to a personal best of 53.74 in the one-lap sprint event. In other action Athletics Central North West’s Miandi van Staden made a statement in the girls U18 100m and 200m sprints after she won the gold medal in both of these events. Boland’s Breyton Poole leaped to a height of 2.16m to grab the gold medal. He won the competition with ease as his nearest competitors could only jump 2.07m.